New student accommodation at Newcastle University features 32,000 Welsh Slates. Some 32,000 Welsh Slates have been used to roof the £13 million development of new student accommodation at Newcastle University. 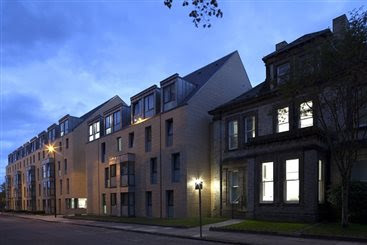 The 500mm x 300mm Penrhyn Heather Blues from the Lagan group company were used on Park Terrace, an exciting development situated in a prime location on campus, close to the city centre, in a Conservation area overlooking Newcastle’s Exhibition Park. Accommodation is spread over up to six floors with lift, on-site entry-phone systems and CCTV. The apartment blocks provide students with en-suite bedrooms in self-catered flats varying in size from six to 11 bedrooms. Each flat has a fully-equipped, contemporary kitchen and comfortable common area with Wi-Fi, flat-screen TV, on-site laundrette and bike storage. Together with the refurbishment of 10 period houses on Kensington Terrace, some 350 en-suite undergraduate bedrooms have been added to the university’s portfolio. 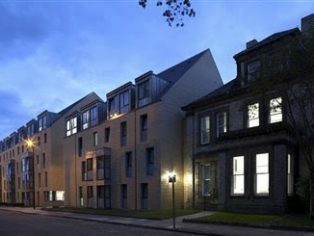 The existing buildings on Park Terrace were demolished to make way for two new buildings including a mews block to the rear of the existing terraces. The project, under a novated design and build form of contract, comprises the construction of the building frame using a pre-fabricated structural framing system. The external finish of the buildings is largely traditional masonry and slate, similar to the buildings they replaced. Park Terrace was the first phase, with Kensington Terrace following a year later. The Welsh Slates were installed by M&C Roofing for main contractor Graham Construction and were supplied by Burton Roofing Supplies. Kensington and Park Terrace received Highly Commended status at the Newcastle University Excellent Contractor Awards 2013. The award scheme recognises contractor excellence based on a range of KPIs (Key Performance Indicators) assessed by the university. The project was nominated by Barry Cottrill, project engineer at the university, and Luke Gardner, senior project manager.